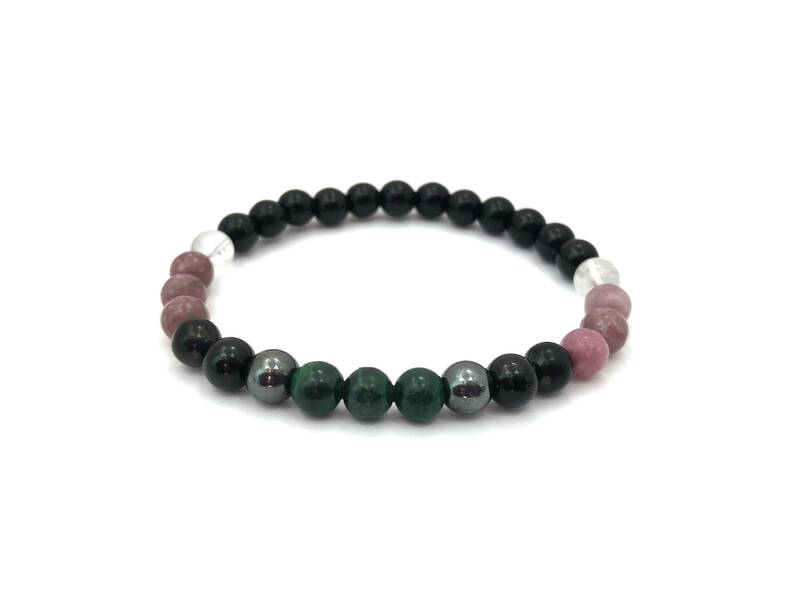 The stones in this bracelet create a powerful shield for negative energy. Perfect for empaths and to protect against psychic attack. Use this bracelet to keep your own energy shielded from that of others and for setting intentions of protection against low vibrational energy. - Malachite: absorbs negative energy, Guards against radiation, clears electromagnetic pollution. Clears and activates the chakras, unconditional love, change, responsibility. - Hematite: A great protective stone that helps to absorb negative energy and calms in times of stress or worry. It stimulates concentration and focus. - Black Tourmaline: vitality, emotional stability, repels negative energy, energy cleansing, protection against low vibrational energy. - Lepidolite: Emotional healing, stress reduction, dissipates negativity. Opens and clears the Crown Chakra, cosmic awareness. Helps overcome dependency supports addiction release. - Clear Quartz: Clarity of thought, harmony, energy, calmness, amplifies energy. - Black Obsidian: Is the grounding stone of choice. It is said to protect against negativity and eliminate energy blockages. Please select your size to ensure a perfect fit. Select your exact measurement with no added inches. If you like a loose fit, measure your wrist exactly where you want your bracelet to fit you. Measure your wrist with a thread or a strip of paper and choose that size. Absolutely beautiful!! I already feel better wearing it!! Thanks so much! Exactly as pictured (for how close individual pieces can be) and shipped with care, arriving in small sachets that were packaged well. I also received a lovely update on shipping status from the shop owner which was kind. And to top it off, a bonus gift was included. I'm definitely happy with my purchases. (3/3). Beautiful dainty bracelet! Love the energy I feel when I wear it. I pair it with my bloodstone bracelet from Yeli. Great and powerful combination.